Keep up with all of the latest updates on Hurricane Florence right here. Tropical Storm Florence is still considered very dangerous with a high risk for flooding rain in South Carolina. 1:29 p.m. - A pickup truck crash in Kershaw County killed the driver, SCDPS reports. This is the fifth Florence-related death in South Carolina. 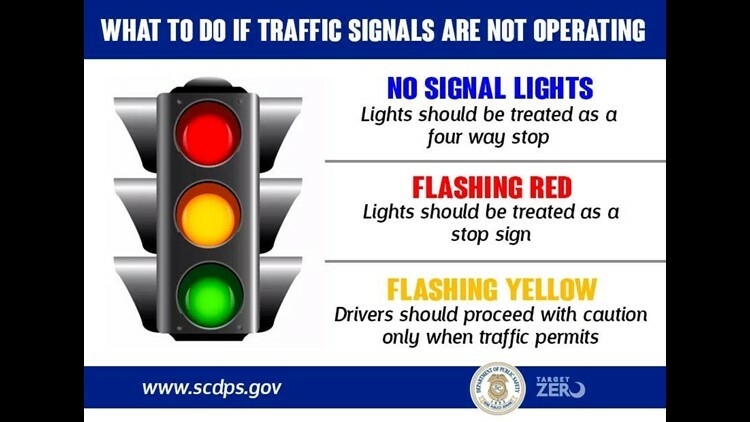 *UPDATE – FIFTH SC WEATHER RELATED FATALITY * SCDPS is reporting a fatal collision in Kershaw County on September 16, at 7am. A pick-up truck was traveling west on I-20 near the 106mm when it traveled off the roadway, striking an overpass support beam. The driver died on scene. 1:05 p.m. - All tornado warnings have expired. 12:30 p.m. - The National Weather Service issued a tornado warning that included Myrtle Beach after a confirmed waterspout was located offshore at 12:17 p.m.
11:27 a.m. - A person died and two others were taken to Conway Medical Center after a pickup truck lost control on a flooded road in Georgetown County. SCDPS said this brings the total number of Florence-related deaths in the state to four. *UPDATE-SC WEATHER RELATED FATALITIES* SCDPS is reporting a fatal collision in Georgetown County on Sept. 16, at approx. 2:30 am. A pick-up truck traveling south on Plantersville Rd. drove into standing water on the roadway. The vehicle lost control, overturning into a ditch. 11:23 a.m. - Lee County School District said it will be closed Monday, Sept. 17, and all extracurricular activities are canceled. 9:14 a.m. Sumter School District announced that its schools and offices will reopen Monday, Sept. 17. The Governor has lifted the order for school closures due to Hurricane Florence, and all Sumter School District schools and offices will reopen on Monday, September 17. Our team has assessed all of our school buildings, and we are ready to welcome back our students and staff. 9:03 a.m. - The SC National Guard filled and delivered sandbags to multiple counties in the state to help protect communities before flooding. 8:31 a.m. - A flash flood warning has been issued for the northern portions of Kershaw County until 2:15 p.m. 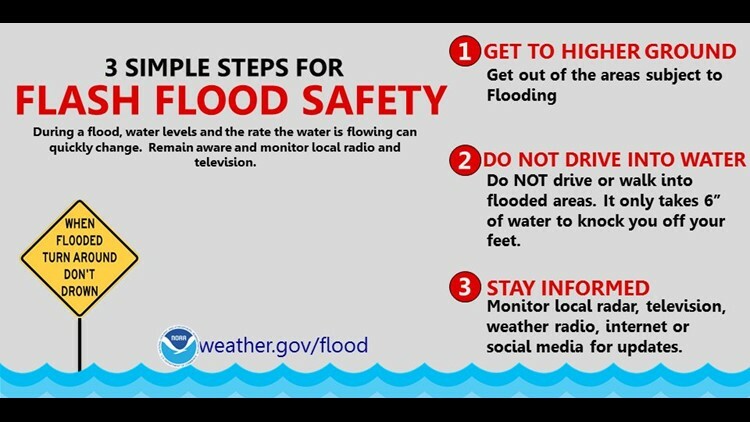 The NWS in Columbia said two to four inches of rain may fall in the warned area, and that heavy rain will likely lead to flash flooding. 8:15 a.m. - SCEMD is ready to help! 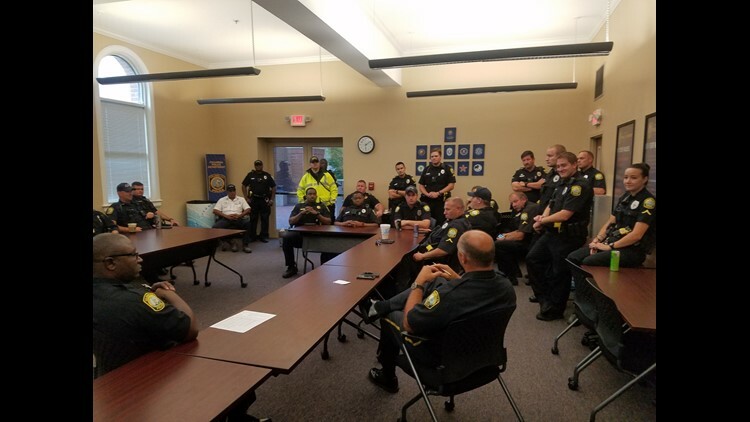 The agency tweeted a photo of its Sunday morning shift change as staff prepare to support local agencies amid the continuing flooding from Florence. 8:02 a.m. - The SCDOT has released a photo of the flooding on I-95 that's shut down a stretch of the road. I-95 is closed in both directions from Exit 181 (SC 38) to Exit 190 (SC 34) due to flooding. 7:40 a.m. - Some parts of South Carolina just can't catch a break. A tornado watch has been issued for parts of the Pee Dee until 5 p.m. Sunday. To be clear, this DOES NOT include the Midlands. 6:12 a.m. - I-95 has been closed in both directions near mile marker 187 due to flooding. A detour is being installed between Exit 198 (SC 34) and Exit 181 (SC 38). Motorists are urged to drive with extreme caution and obey the speed limits. 5 a.m. Florence has been downgraded to a tropical depression. Slow moving Florence will continue to produce significant rainfall amounts across the Southeast as the system moves inland. At 5 a.m. Sunday, Florence was about 20 miles southwest of Columbia. It has top sustained winds of 25 mph and is moving west at 8 mph. The National Hurricane Center said this is the last advisory it will issue on Tropical Depression Florence. Future advisories will be issued by the NWS's Weather Prediction Center. 11:34 p.m. Crews in Darlington are starting the clean-up process. 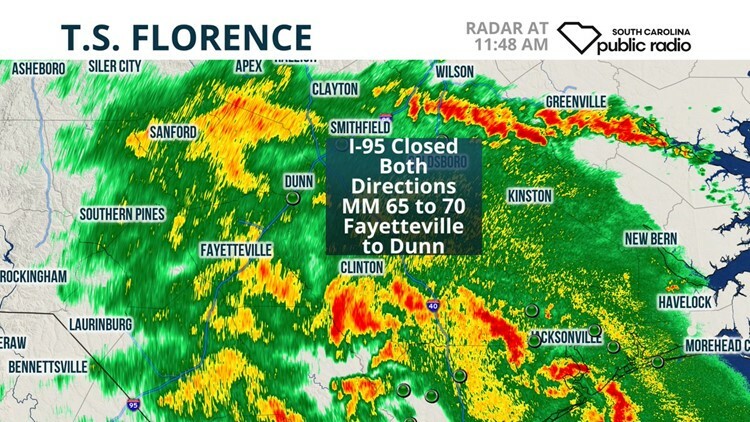 10:01 p.m. Florence's center has moved into the Midlands near Manning. 10:00 p.m. Two lines of thunderstorms have developed and are both moving into southeast North Carolina. This will increase rainfall over the area from Charlotte to Fayetteville to Wilmington. Heavy rain can be expected. 9:58 p.m. Rainfall estimates have exceeded 20 inches over the oast 48 hours. 9:56 p.m. More than 20,000 power outages reported by the Electric Cooperative of SC. Most come from Horry, Chesterfield, Dillon and Darlington counties. 9:42 p.m. Columbia has two large power outages: one on Garners Ferry Road and another near Percival. About 5,700 people are without power in Richland County. 8:42 p.m. Just under 500 Duke Energy customers are without power in Sumter County. 8:28 p.m. With improving weather conditions and forecasts, the University of South Carolina Columbia campus will resume normal operations and all classes will be held on Monday, September 17. 8:10 p.m. COMET will restore limited service on Sunday and full service on Monday. 7:48 p.m. Richland County will resume normal operating hours Monday, Sept. 17. 7:44 p.m. When in doubt, throw it out! Throw away any food that has been exposed to temperatures 40 degrees or higher for two hours or more, or that has an unusual odor, color or texture. 7:43 p.m. Darlington County is back on a 7 p.m. curfew, since officials are worried about potential flooding. 7:40 p.m. Tweet from Trooper Sunny: If you are returning to the beach tomorrow please utilize alternate routes. SC 22, and 31 can be used instead of US 501 especially for northern beaches. Traffic congestion is expected during re-entry tomorrow morning. 7:17 p.m. Employees of Williamsburg County School District will report to work on Monday, September 17 at 8:30 a.m. Students will return to work with a 2-hour delay on Tuesday, September 18 due to road conditions. 6:57 p.m. The Greater South Carolina District of the U.S. Postal Service has reopened most Post Offices and resumed mail deliveries September 15, in areas that begin with ZIP Codes 294 and 295. Post Offices in these areas were closed temporarily beginning September 12 to prepare for possible flooding. 6:18 p.m. All Georgetown County curfews have been lifted. 5:39 p.m. 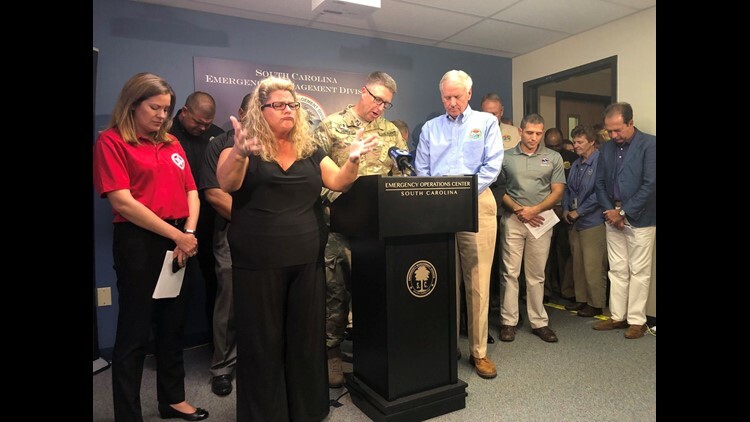 In coordination with local officials, Governor Henry McMaster announced that evacuation orders for Horry and Georgetown counties will be lifted tomorrow morning, Sunday, September 16 at 9 a.m.
5:28 p.m. There are now less than 1,000 Duke Energy customers without power in Sumter County. 5:16 p.m. Tropical storm warning has been canceled in the Midlands. 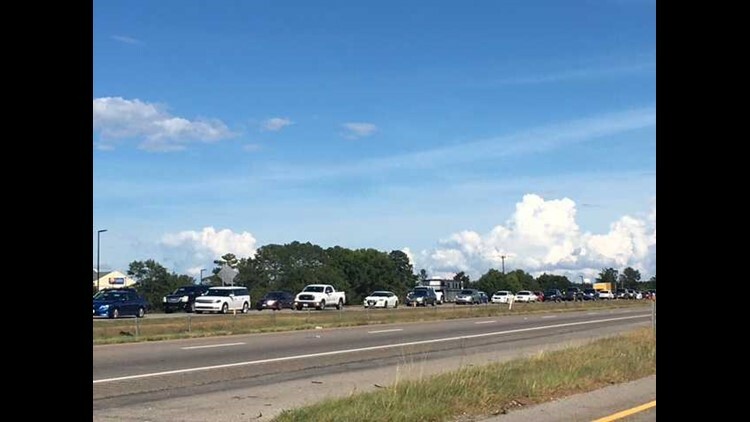 5:13 p.m. Samaria Highway near I-20 remains open despite a downed power line. 5:12 p.m. One lane is block on I-26 East at mile marker 111 due to a collision with injuries. 5:10 p.m. 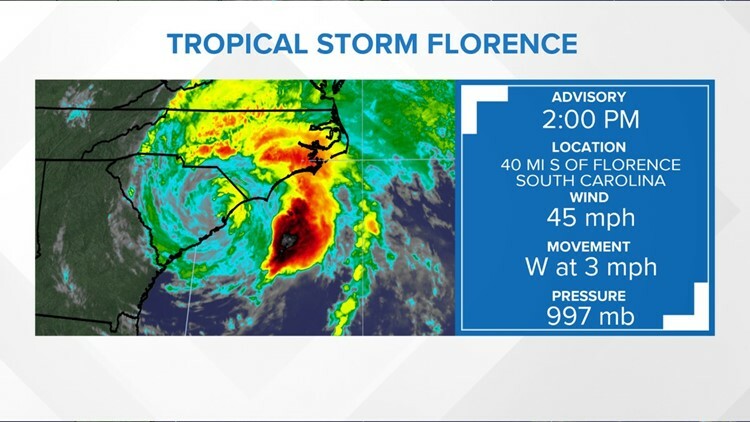 Tropical Storm Florence is moving west at 2 mph. 3:48 p.m. Lexington County: tree down on the 1600 block of Jessamine Road. Seek alternate route. 3:45 p.m. Columbia police are prepared to deploy to the coast if needed. 3:38 p.m. A city-wide curfew will be in effect for Hartsville starting at 7 p.m. September 15 and ending at 7 a.m. September 16. 3:36 p.m. Charleston International Airport opened for limited recovery operations aircraft only. Commercial flight status will be based on Gov. Henry McMaster's evacuation orders. 3:34 p.m. Lexington County: tree in the roadway on the 1800 block of Windmill Road near Batesburg-Leesville. Seek alternate route. 3:20 p.m. The South Carolina National Guard has deployed several vehicles to check for Florence damage. 3:09 p.m. Gov. 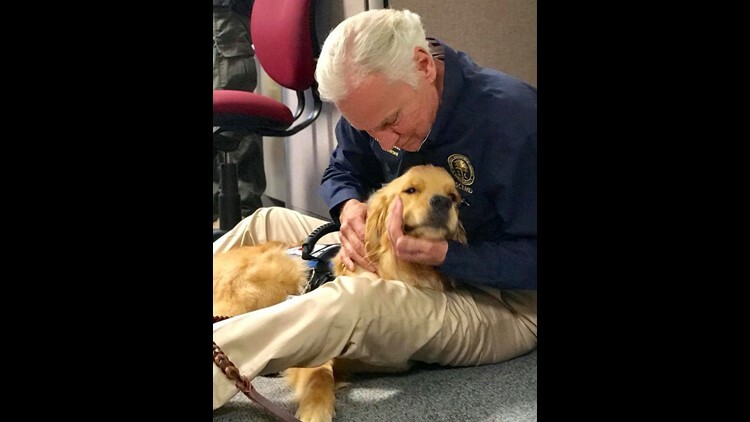 Henry McMaster got a special greeting from Callie, a therapy dog over at the Emergency Operations Center. 2:58 p.m. FAA Warning: Don't fly drones near or around areas impacted by Florence. Interfering with emergency response operations may result in a $20,000 fine. 2:46 p.m. Look down! Florence ma throw some extra cash your way! 2:44 p.m. Florence is moving slowly across South Carolina at 3 mph with 45 mph winds. 2:42 p.m. A large tree fell at Gaston Elementary, but the building didn't sustain and severe damage. 2:42 p.m. A meeting will be held at Richland 2 Sunday to discuss school openings and closings for the week. 2:41 p.m. Midlands homeless shelters have been on expanded capacity since Wednesday, serving over 100 more meals than usual. 2:40 p.m. Columbia Fire says they haven't responded to any disastrous incident today. They thank everyone for staying off the roads as much as possible. 2:37 p.m. Don't forget to call the WLTX phone bank with all your Florence questions: 803-647-0299. 2:36 p.m. Current temperatures, radar, wind and wind gusts across the Midlands. 2:34 p.m. A statewide burn is still in effect, which prohibits all outdoor, agricultural and land-clear burning. A $1,000 fine is possible for offenders. 2:32 p.m. River flooding is expected to be a major issue next week. 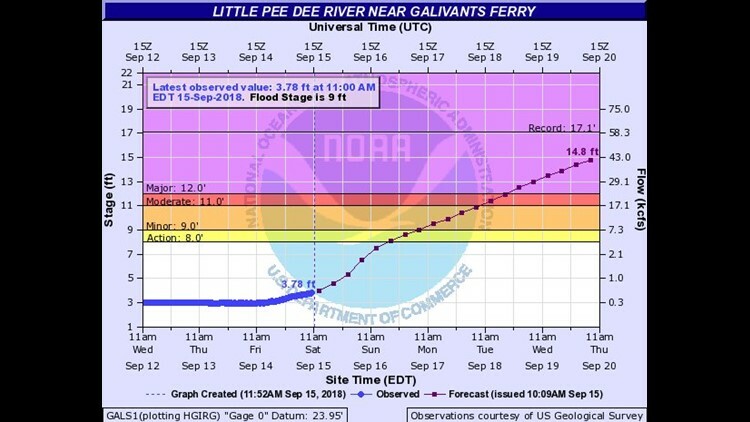 Water is expected to be above major flood stage for Little Pee Dee River near Galivants Ferry Tuesday. 2:30 p.m. It's still there! The cone over at Zesto in West Columbia is still standing. 2:29 p.m. I-95 is closed from mile marker 65 to 70 in both directions. 2:28 p.m. Questions about re-entry in evacuation zones? Call 1-866-246-0133. 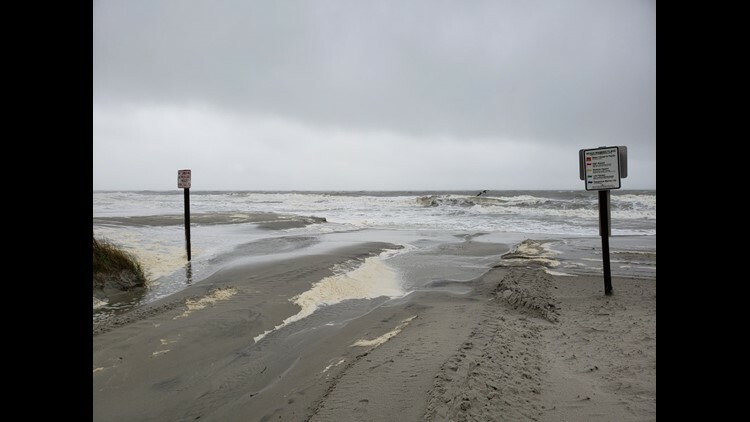 2:27 p.m. A storm surge is happening over in Myrtle Beach at 55th Avenue. 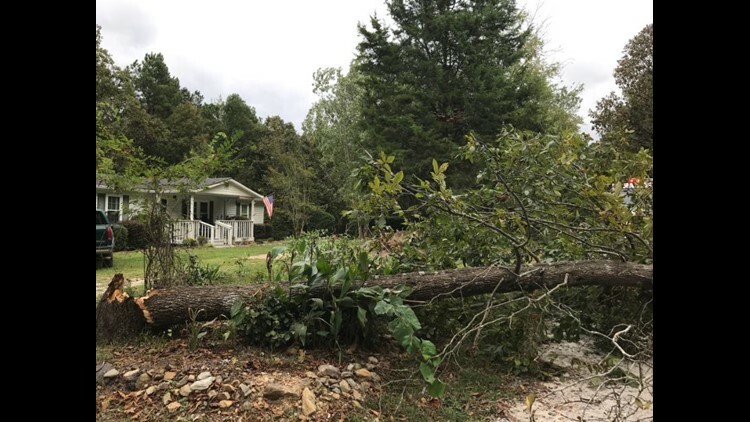 1:33 p.m. A Sumter resident said he and his wife woke up to a loud thud Friday night and found a tree had fallen onto their car just outside their home. Fortunately, the homeowner said he doesn't think the car or the home sustained any damage. 12:32 p.m. Lexington County resident Joe Pilot said he was able to move everything out of his home and into a storage unit within 45 minutes with the help of his friends after Florence's strong winds blew the roof off of his home Saturday morning. 12:20 p.m. Charleston Airport has resumed flights after the evacuation order for the area was lifted. 12:12 p.m. Gov. McMaster will hold a media briefing with state emergency response officials at 2:30 p.m. WLTX will have live coverage. 11:36 a.m. Gov. 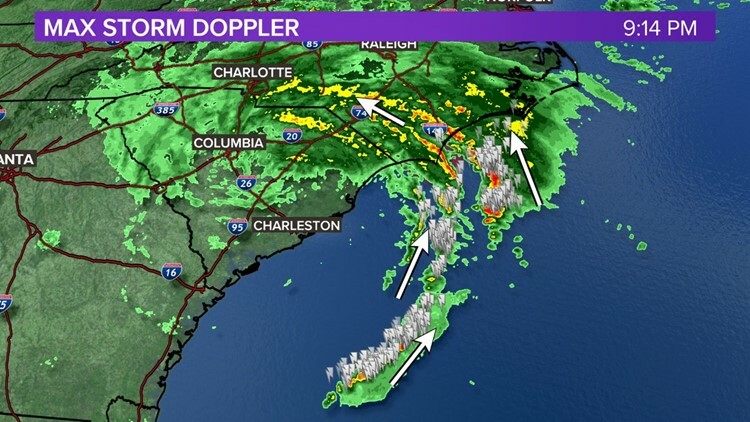 Henry McMaster announced that evacuation orders will be lifted for residents in Charleston, Dorchester and Berkeley Counties, along with Edisto Beach in Colleton County, at noon on Saturday. 11:10 a.m. More than 6,200 people spent Friday night in around 70 shelters in South Carolina, according to a tweet from the American Red Cross in South Carolina. 10:39 a.m. News 19's Nic Jones is checking with the Sumter County Sheriff's Department checking out a special vehicle they plan to use to help those impacted by flood waters. 10:05 a.m. In Lexington County, Florence has picked up enough steam to bring the roof off Joe Pilot's home on Wire Road. 9:34 a.m. SCEMD is reporting more than 172,000 power outages across the state, as well as downed trees, power lines and impassable roads. 8:15 a.m. 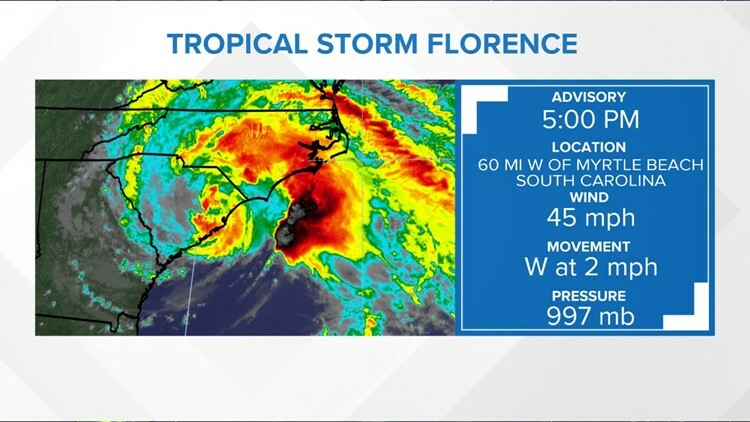 Tropical Storm Florence is very slowly making her way inland. 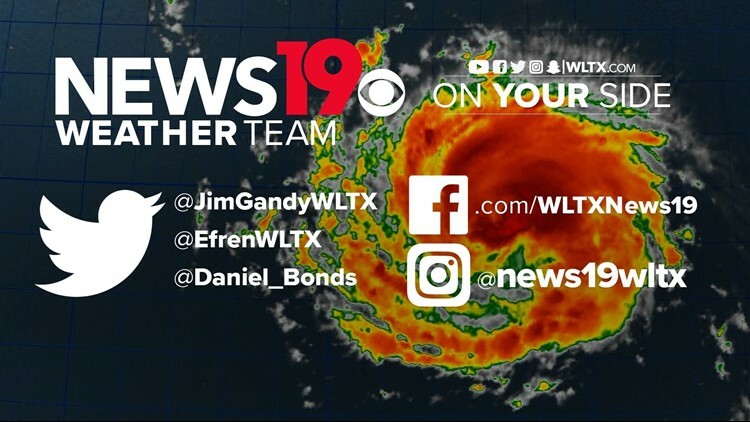 5:00 a.m. Crews at WLTX are working around the clock to ensure that our viewers have the latest and most up to date information as Tropical Storm Florence continues to make its way toward the inlands. Stay engaged with us on Facebook Live as we provided the latest information and answer your questions. 4:30 a.m. Tropical Storm Florence has caused more than than 165,000 households throughout South Carolina to lose power. If you need to report an outage in you area, SCEMD has compiled a list of agencies that will be monitoring and working to restore outages. 3:30 a.m. Help is available 24/7. According to the South Carolina Emergency Management Division; the Public Information Phone System has answered more than 7,500 calls. To get your questions answered call them at 1-866-246-0133. 11:50 p.m. The eye of Hurricane Florence is heading towards Manning and Clarendon county is getting heavy wind and rain. 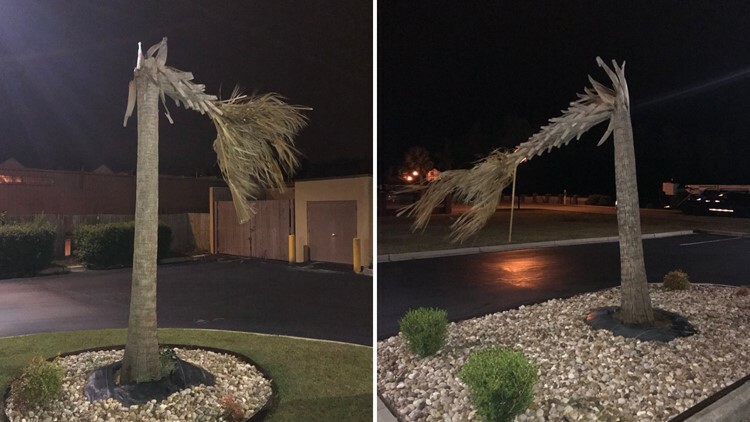 10:57 p.m. Two palm trees in Sumter snapped from the wind. 10:41 p.m. Winds are passing through Florence tonight, which can been with a flag that's still standing. I leave you with this tonight. The last 3 nights we’ve ended with the beach, but today I say goodnight with the Palmetto Flag still flying in Florence. 10:40 p.m. 1,797 people are now without power in Sumter County. 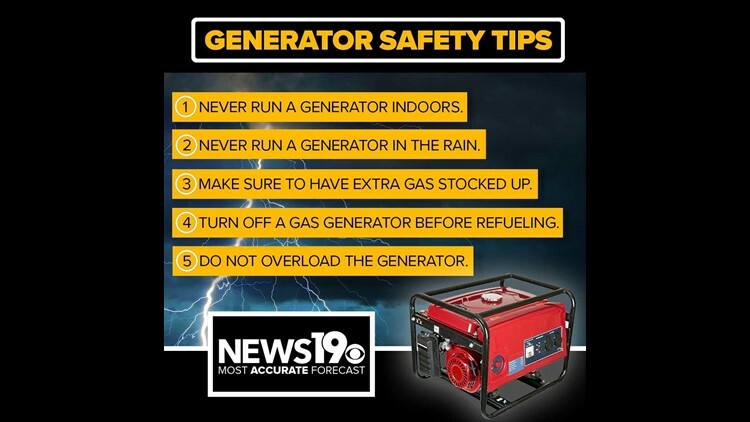 10:30 p.m. How to safely use a generator. 9:57 p.m. Talk about strong winds, one News19 reporter lost her hat during a powerful gust. 9:56 p.m. 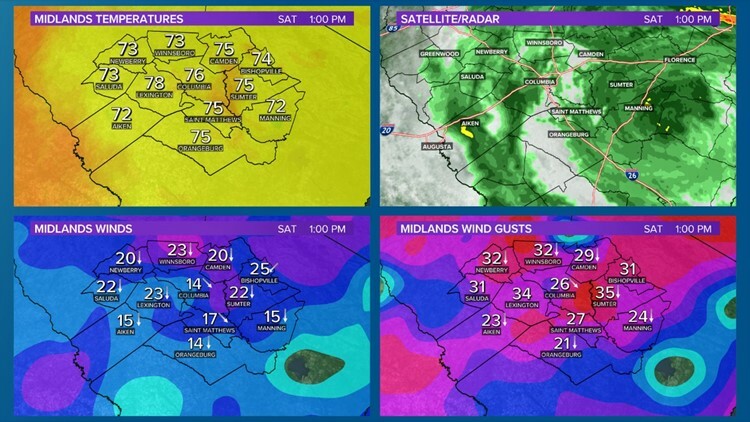 Winds are increasing across the Midlands with 40-55 mph gust seen in different cities. 9:11 p.m. Utilities lines are down on the 3800 block of Highway 6. Roadway is not block, but drivers should watch for emergency personnel. 9:10 p.m. Swift water rescue teams have arrived in Mullins, South Carolina. 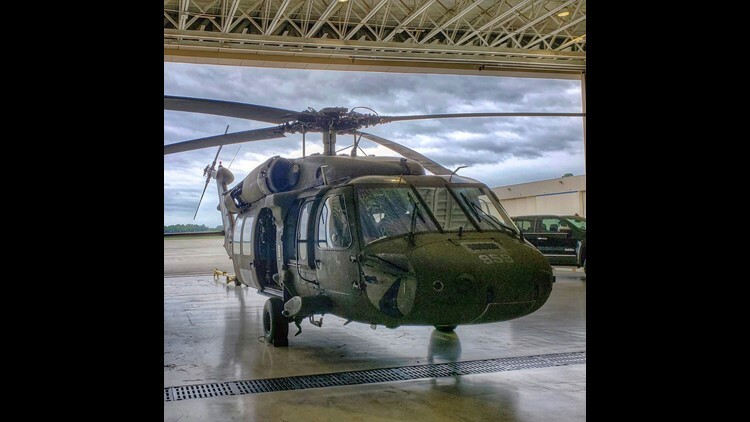 9:01 p.m. SC National Guard South Carolina Helicopter Aquatic Rescue Team @SCStateFire UH-60 Black Hawk stands ready for rescue missions in response to Tropical Storm Florence. 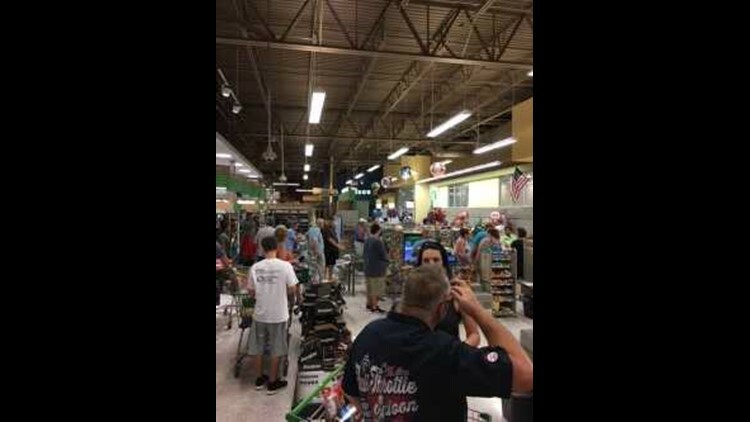 8:30 p.m. Schumpert's IGA will remain open EVEN IF THE POWER GOES OUT. Shumpert's IGA at 861 Pine Street in Pelion has a full-store generator. They are making and bagging their own ice. 8:30 p.m. Nearly 3,000 SCE&G employees and contract personnel, including more than 500 out-of-state utility workers, are standing by to restore power to customers affected by the strong wind and rain of Florence. 8:11 p.m. 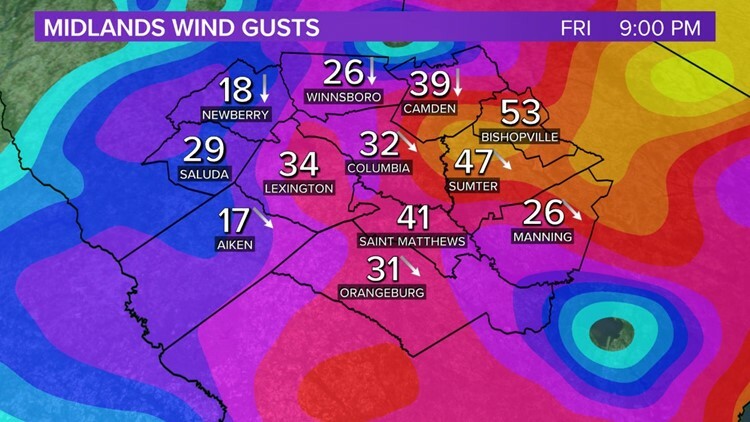 Peak wind gusts now: Florence 56 mph, Shaw AFB (Sumter) 51 mph. 7:47 p.m. Utility lines down on the 100 block of Able Harmon Lane. 7:38 p.m. 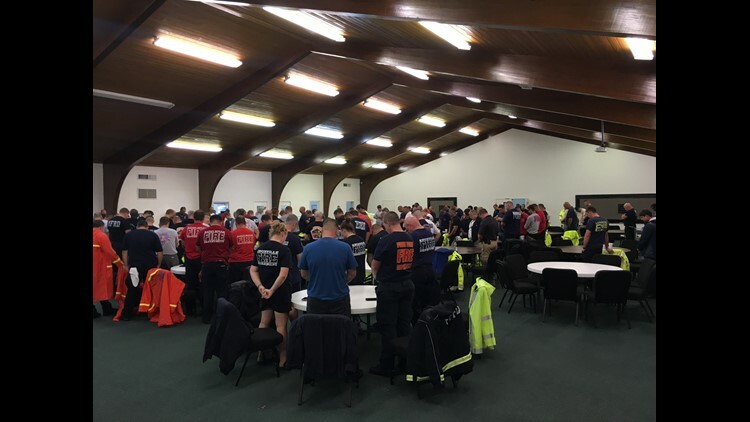 Firefighters from Louisiana and Tennessee gathered for a moment of a prayer before their missions during Florence. 7:24 p.m. GoPro video captures the storm as it passes through Florence. Car overturned on I-26 exit ramp at August Highway. Injuries reported. 6:49 p.m. Columbia police officers will begin 12-hour shifts tonight. They will monitor road access, flooding and open shelters. 6:03 p.m. Florence's track has been locked in on southern North Carolina. 6:02 p.m. Diaper Bank of the Midlands will distribute baby items to families affected by Hurricane Florence on September 18 at 6615 Two Notch Road from 10 a.m. to 1 p.m. Diapers, baby clothing and wipes will be given out free of charge to families in need. 5:52 p.m. Road closed near 300 block of Wyatt Way due to tree downed across roadway. No injuries. Road closed until LCFS and Public Works crews can remove tree from road way. 5:27 p.m. Road closed at Corley Mill Road near Andrew Corley Road in Lexington due to down utility lines in the roadway. LCFS crews have closed the road. 5:09 p.m. Sumter County residents without power has increased from 16 to 237 in one hour. 4:56 p.m. Shaw Air Force Base is now at Hurricane Condition 1 (HURCON 1), which indicates that winds of 58 miles per hour or greater are possible within 12 hours. 4:40 p.m Platt Springs Baptist Church at 1351 Pine Street in West Columbia will be serve soup and corn bread Saturday from 11 a.m. to 1 p.m. to anyone who might need a hot meal. 4:44 p.m. Florence has been downgraded to a Tropical Storm. 4:42 p.m. Water rescue crews are currently head east on I-20 near Bishopville. 4:30 p.m. Stone Stadium in Columbia is seeing some windy conditions. 4:26 p.m.The Nickelodeon Theatre remains open Friday, but will close Saturday. Sunday's hours are TBD. 4:20 p.m. Currently some 38,900 Santee Cooper retail customers are without power due to early impacts from Hurricane Florence. 3:45 p.m. For emergencies in the town of Lexington you can call: For water/sewer/utility issues: 803-359-2434. 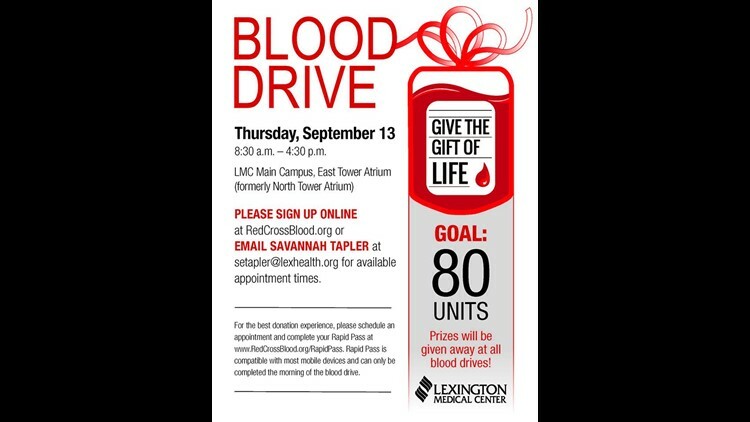 Non-threatening emergencies for Lexington County: 803-785-2521. 3:11 p.m Wells Fargo bank branches in the Columbia area will close at 4 p.m. and remain closed Saturday. All branches in the upstate will be closed Saturday as wll. 2:45 p.m. Darlington county sheriff has issued a county wide curfew throughout Darlington counties to be in effect from 7 p.m to 7 a.m. The curfew will remain in effect until further notice. This does NOT apply to first responders, those traveling for work and medical emergencies. 2:40 p.m. All Voorhees College students remaining on campus will evacuate to the Red Cross evacuation site located at the Leonard E. Dawson Center on campus. Voorhees central administration will be there to assist students along with the Red Cross staff. 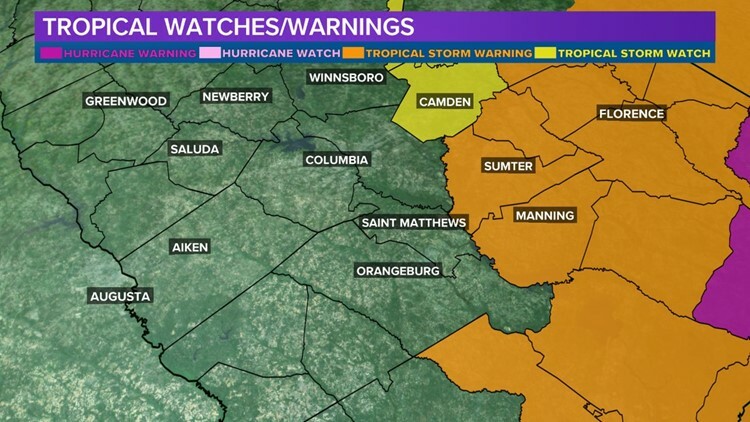 2:38 p.m. Saluda County Sheriff's office says if you know of a senior citizen that needs to be checked on during the weather please contact them at (864) 445-2112. 2:36 p.m. Richland county has an emergency shelter that accepts pets. The shelter is located at 3216 Broad River road and will open at 5 p.m. (Friday). This shelter is pet friendly for cats and dogs only. It is right across the street from the Widewater shopping center. Cats must be in carriers and dogs must be on leashes, you will also need to bring food, water and the animal's vaccination records. 2:36 p.m. 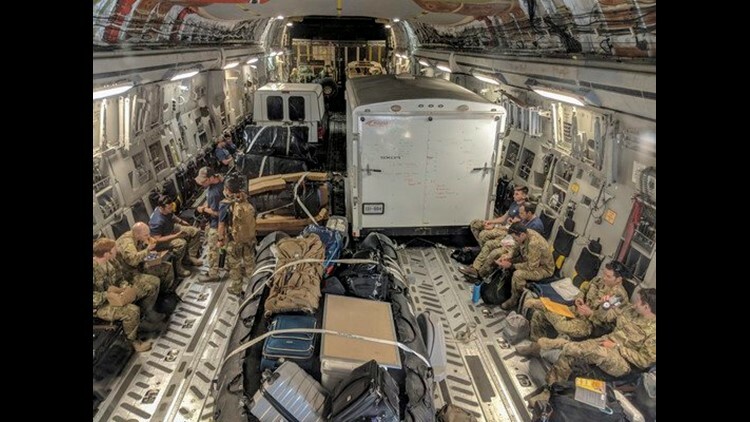 The City of Columbia is set to give an update on Florence preparations at 3:30 p.m.
2:34 p.m. Pictured below: Guardsmen from as far away as Alaska and California are ready to respond. Put a thermometer in the fridge. If the temp is 40 degrees or higher when power's restored, throw food out. 2:31 p.m. FEMA and NC Emergency give these safety tips during a power outage. 2:31 p.m. 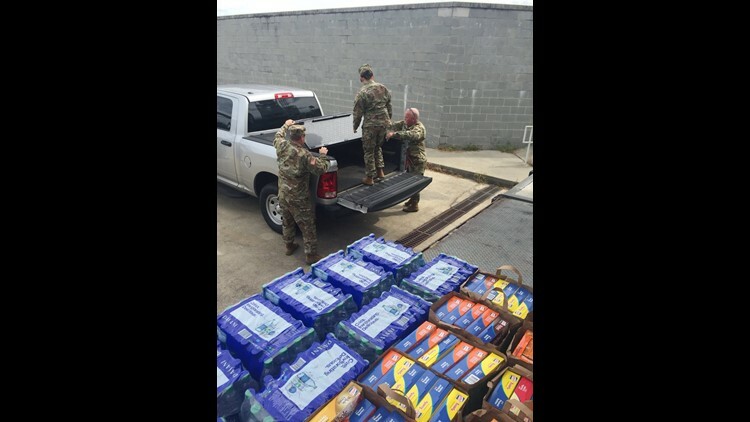 This photo shows SC National Guard as they load supplies to help out on the coast. 2:29 p.m. Florence's winds have weakened to 75 mph, making it barely a hurricane. The storm is now moving at 6 mph. 2:28 p.m. One Wilmington resident explains why his older family members decided not to evacuate. 2:27 p.m. Stay in-the-know with the CodeRED app. Register with the county to get information about all emergencies and disasters. 2:27 p.m. All Richland Library locations are closed. Check richlandlibrary.com September 14 for updated hours. 2:27 p.m. 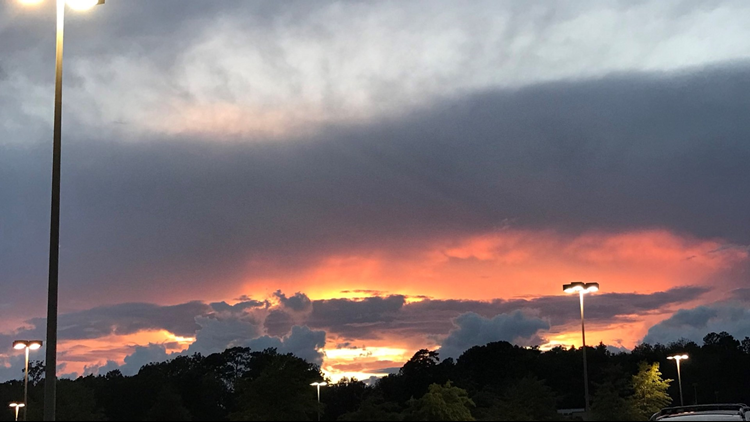 PHOTOS We're sharing your photos as Florence as tracks across the Carolinas. 2:25 p.m. The City of Columbia swore in 13 police cadets Friday afternoon in advance of Hurricane Florence. 2:12 p.m. The S.C. Emergency management Division is reminding residents statewide to be prepared for 'catastrophic flooding' due to Hurricane Florence. 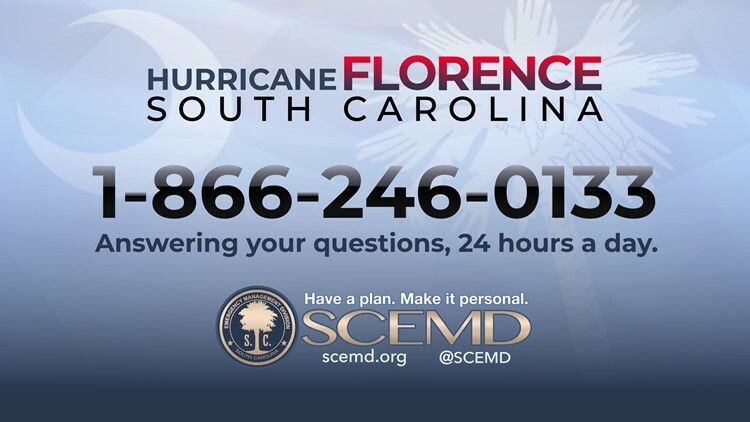 SCEMD's emergency hotline is open around the clock to answer your questions. Call 1-866-246-0133 if you need assistance. 1:31 p.m. Gov.Henry McMaster and emergency management officials will update the public on Hurricane Florence's potential impact to South Carolina at 2:30 p.m. today. News 19 will stream the briefing live on air, online and on Facebook Live. 1:25 p.m. The City of Columbia is asking resident to cease putting yard trash and bulk items for disposal at the curb to help keep storm drains and and roads clear. 1:19 p.m. The City of Columbia will update resident on Hurricane Florence preparations at 3:30 p.m. today. 1:10 p.m. S.C. Army National Guard Soldiers and fire department/EMS rescuers with the S.C. National Guard deployed from McEntire Joint National Guard Base to Charleston Thursday. SCNG says it has more than 3,200 Soldiers, 77 airmen, 100 State Guard members 20 Pennsylvania Guard members supporting Team SC. 12:12 p.m. Facebook has activated Safety Check for those in the path of Hurricane Florence, which is already bringing catastrophic flooding to the North Carolina coast. 10:30 a.m. Here's something you don't see every day! Dolphins were swimming in the rising waters near the shore just after Hurricane Florence hit near Wilmington this morning. 10:20 a.m. News 19's Nic Jones spoke with one man evacuating ahead of Hurricane Florence who says he slept with his dogs in his truck last night to comfort them. 9:49 a.m. WOW! Check out this picture of an SUV nearly under water in New Bern, NC. 8:05 a.m. 8 AM UPDATE: Life-threatening storm surges and hurricane-force winds continue after Florence made landfall this morning near Wrightsville Beach, NC. The hurricane will continue to move slowly westward to southwestward Friday through Saturday. 8:02 a.m. HAVE HURRICANE FLORENCE QUESTIONS? Call the News 19 Help Desk at (803) 647-0299, and we can find you the answers you need. 7:35 a.m. 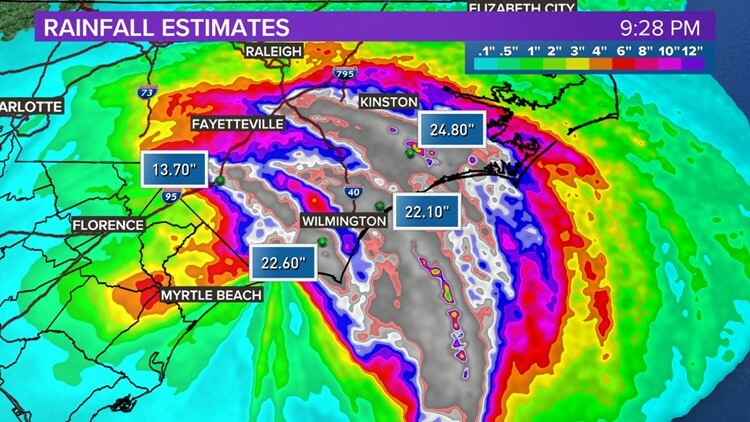 The center of the eye of Hurricane Florence officially made landfall at 7:15 a.m. near Wrightsville Beach, North Carolina, according to the National Hurricane Center. Maximum sustained winds are estimated to be 90 mph. 11:03 p.m. DO NOT TEXT 911: Out of an abundance of caution, citizens in the City of Columbia and Richland County are urged not to use the Text to 911 feature that was announced by Richland County today: "While we are excited about this new technology, we feel that it is not in the best interest of public safety to launch this new feature during a critical weather event." 8:56 p.m. I-26 Eastbound lanes are now open for normal traffic flow. The flush and breakdown for Hurricane Florence lane reversal is complete. However, the evacuation is still in effect. 8:00 p.m. The SC Emergency Operations Center will be operational 24 hours a day until further notice. 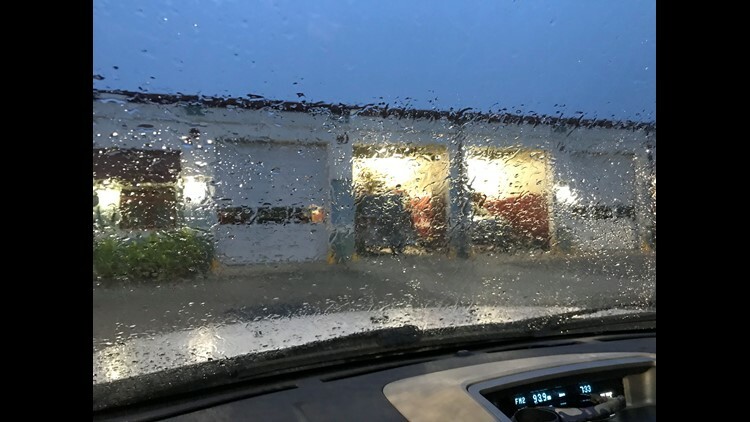 7:56 p.m. Bands of torrential rain will are expected to move into the Charleston tri-county area Friday, according to the National Weather Service. 7:50 p.m. Red Cross Sumter shelters are open at Sumter High School at 2580 McCrays Mill Road and Mayewood Middle School at 4300 East Brewington road. Service animals are allowed at both shelters but NOT pets. 6:52 p.m. Due to the hurricane all 11 Lexington county collection, recycling centers will be open on Friday September 14 until 5 p.m. They will be closed on Saturday September 15. 6:36 p.m. 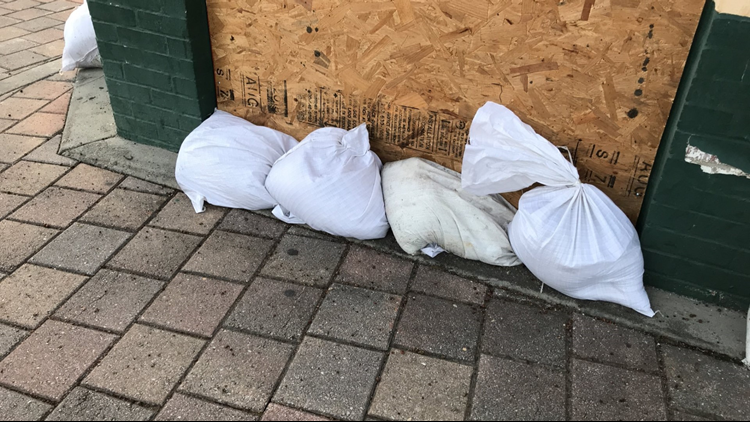 Emergency management is warning residents not to use beach sand when sandbagging. 5:33 p.m. Historic Columbia will close its house museums and will cancel all tours Friday, Saturday and Sunday. They will resume with normal hours on Tuesday, September 18. 5:32 p.m. The SC State Museum will open again Friday, September 14, for kids ages 12 and under and evacuated families. General admission is free. 5:20 p.m. Lane reversal on I-26 will end at 6 p.m. But SCDOT shared a photo of the I-26 crossover near I-77 — rainbow included. 5:19 p.m. Shelter locations are constantly being updated on the SCEMD website: scemd.org. 5:06 p.m. The WLTX phone bank is back! 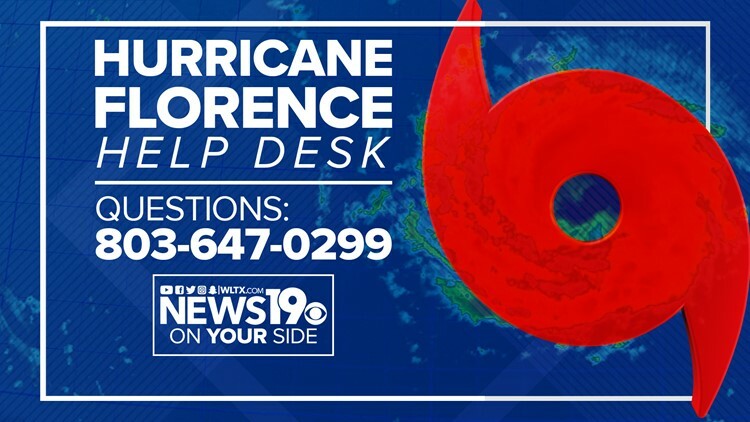 Call 803-647-0299 with all your Hurricane Florence questions! 5:05 p.m. A tropical storm warning has been issued for Clarendon, Lee and Sumter counties. A tropical storm watch is now in effect for Kershaw County. 5:04 p.m. 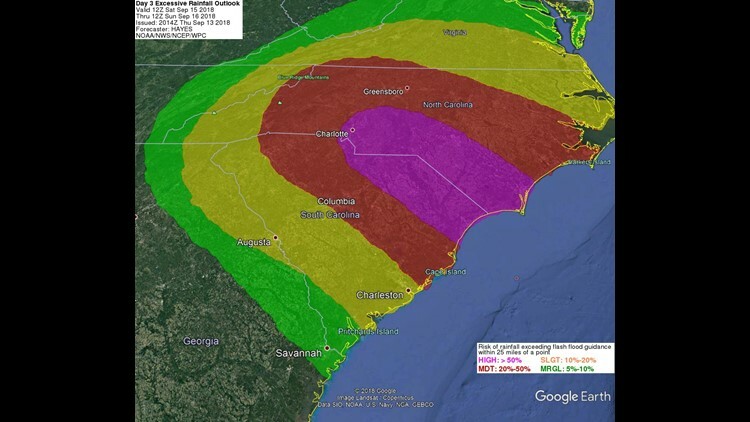 There have been several rumors about Hurricane Florence, but we have the answers! RUMOR: FEMA Does Not Have Enough Commodities On The Ground In Preparation For Hurricane Florence. FACT: The private sector is the first source for goods in the potentially affected areas. When their supply chain is disrupted, or stores are unable to open, then state, local and voluntary agencies will provide needed supplies. FEMA, working in coordination with those officials, will augment state and local resources as needed and requested. FEMA is forward staging meals, water, cots, blankets and other resources at Incident Support Bases in the Carolinas, Georgia, Virginia, and West Virginia to supplement the needs following Hurricane Florence. The quantity of supplies on hand will fluctuate as supplies are continuously moving. RUMOR: There Are Reports That All Emergency Shelters And Hotels Are Required To Accommodate Pets For People Who Have Evacuated. FACT: Service animals are not pets. The Americans with Disabilities Act generally requires hotels and evacuation shelters to accommodate service animals. Private businesses, such as hotels, are not required to accept pets. Not all shelters accept pets. Check local media, or contact your local emergency management agency for shelters that do allow pets. Pet-friendly shelters may have requirements and restrictions for pets. Check their requirements before arriving at the site. RUMOR: There Are Reports That Beach Sand Should Be Used If Sand Bag Distribution Sites Are Out Of Sand. This Is FALSE (September 12) FACT: Local emergency management in coastal areas is warning residents not to use beach sand for sandbagging. Residents should NOT be heading toward the beach. Also, sand at the beach is a vital barrier, acting as the first line of defense against the storm. 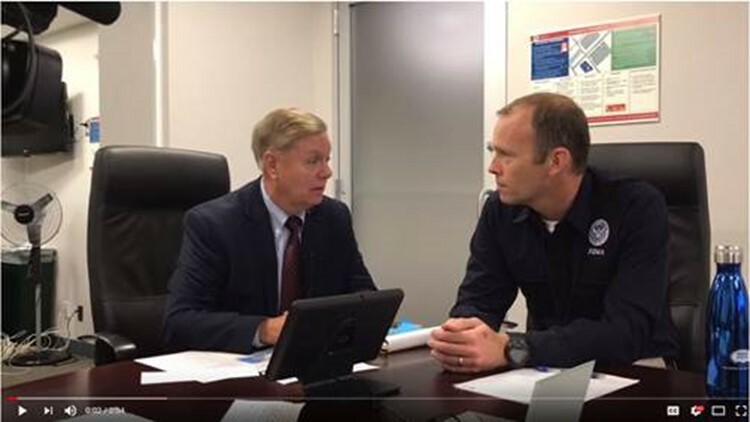 4:50 p.m. U.S. Sen. Lindsey Graham met with the Administrator of the Federal Emergency Management Agency Brock Long at FEMA’s National Response Coordination Center in Washington, D.C. Graham and Long discussed safety precautions for South Carolina and preparation for post-storm recovery efforts. 4:45 p.m. The following city parking garages are now full in Charleston: Queen St, Visitor Center, Wentworth, East Bay, Majestic Square and Francis Marion. 4:35 p.m. The Allendale County shelter opened today at noon. It is located at the Allendale Elementary School at 3305 Allendale-Fairfax highway. 4:33 p.m. United States Postal Service is suspending service in Charleston for area codes that begin with 294 or 295. Customers can call 1-800-ASK-USPS to obtain alternate Post Office locations. 4:28 p.m. Residents in Richland County can text 911 for help during the storm. It should include the location and type of assistance need. Abbreviations, symbols or emoticons should be avoided. 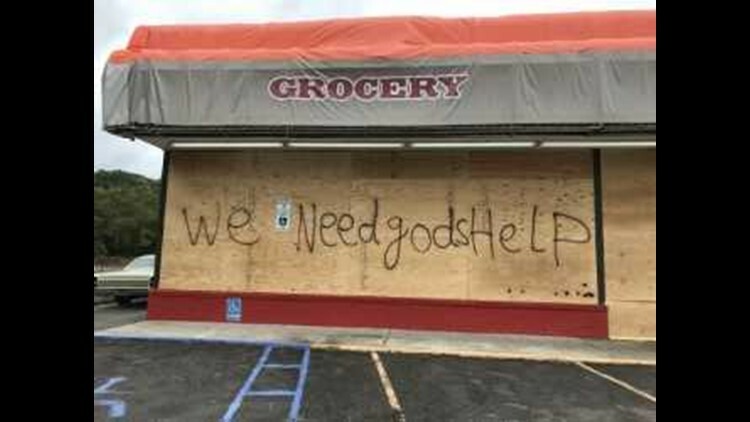 4:23 p.m. Florence businesses are boarding up against the storm — and thieves! One business owner says they've been robbed during past hurricanes. 4:01 p.m. USC-Columbia has canceled classes through September 17. The campus is also shut down. Classes are expected to resume on September 18. 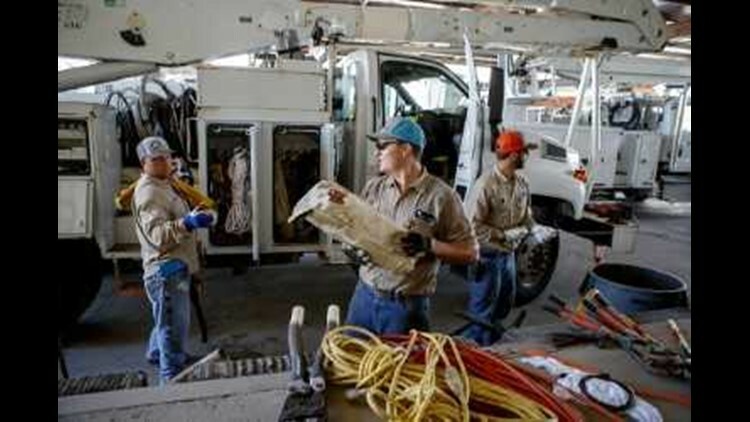 3:35 p.m. Santee Cooper will have approximately 130 line and tree crews –roughly four times the number during normal conditions — working to restore outages on its system caused by Hurricane Florence, including more than 70 mutual aid and contract crews coming from Florida, Tennessee, Alabama, Louisiana and Missouri. 3:27 p.m. 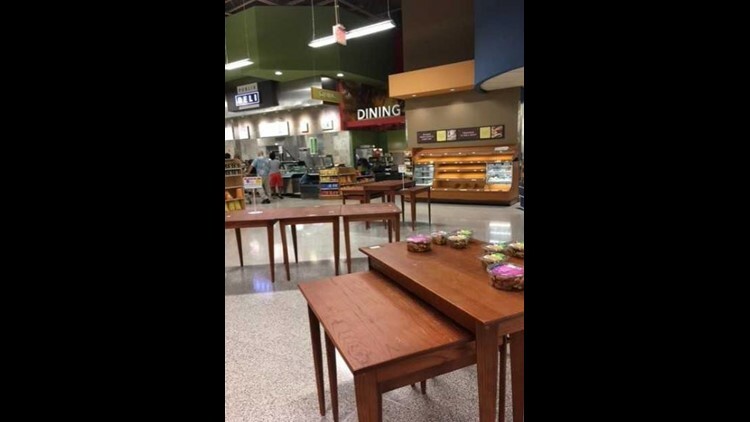 The Publix at Carolina Forest in Myrtle Beach was packed and resident Sarah Kennedy took these photos. 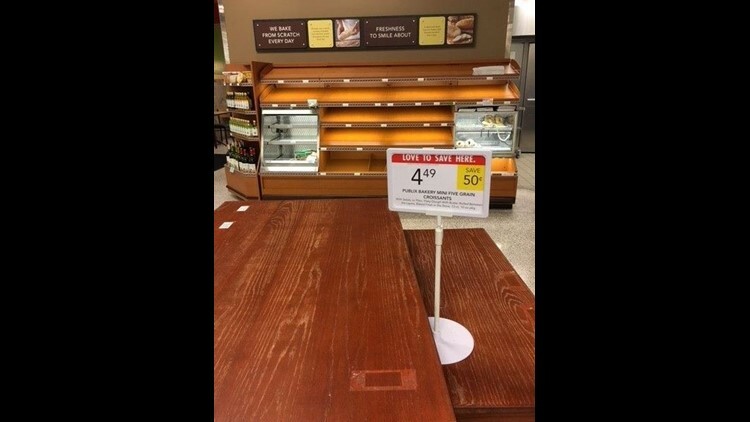 She said all the bread was gone and folks were snapping up ice cream. 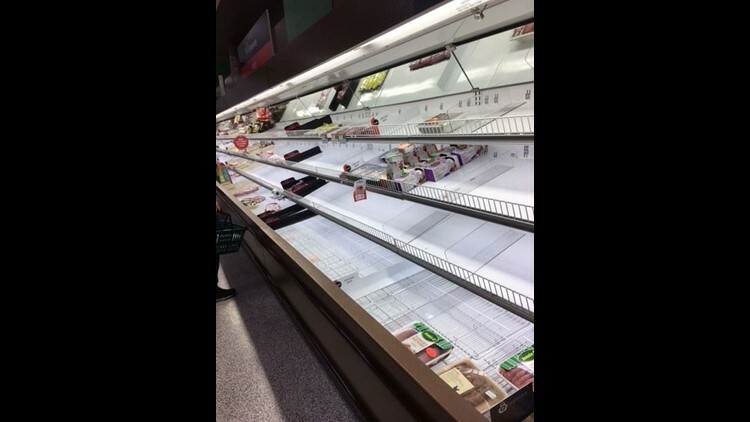 All major grocery stores in Myrtle Beach area she said are all closed now. 3:20 p.m. News19's Jacob Reynolds give an inside look at what Myrtle Beach looks like this afternoon before the storm hits. 3:18 p.m. During a press conference, Richland County officials say they are expecting wind gusts, heavy rain and flooding mid-day Saturday into Sunday. 3:02 p.m. More than 2,100 South Carolina National Guard airmen and soldiers have been mobilized. 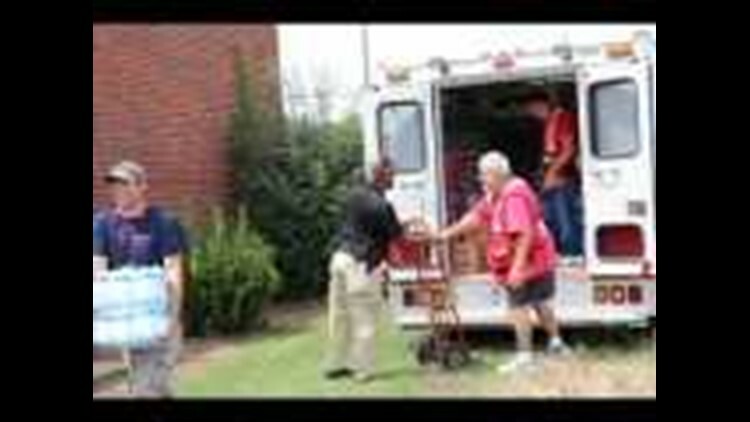 3:01 p.m. About 25 evacuees enjoyed a free football game at Newberry College. 3 p.m. U.S. 501 lane reversal is now complete out of Myrtle Beach. 2:59 p.m. Gov. Henry McMaster's press conference began with a prayer, asking for help and guidance during the storm. Make sure candles are on a stable surface in a fire resistant holder that is at least 12 inches away from anything flammable. 2:43 p.m. A gas station in Florence County is already shut down as the storm approaches. 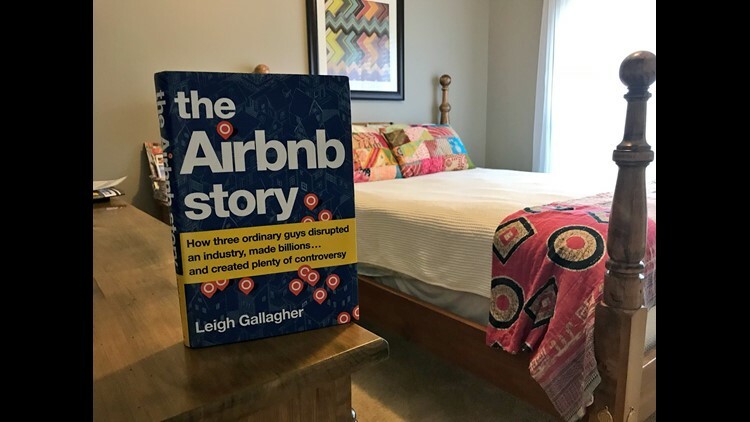 2:41 p.m. Airbnbs around Columbia are stepping up to help evacuees. 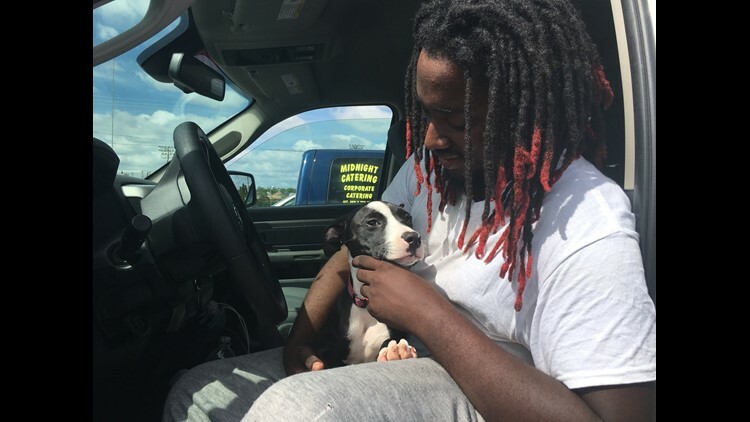 2:39 p.m. News19's Michael Fuller met an evacuee who is struggling after his shelter won't allow his new dog. 2:14 p.m. Wells Fargo branches in Sumter will be closing today at 3 p.m.
1:40 p.m. The City of Columbia is urging residents to cease putting yard trash and bulk items at the curb. This will help keep storm drains and roads clear of debris to reduce potential flooding. Bagging yard trash is not required, but recommended during potential high winds and storms. The Solid Waste Division will continue to collect yard trash on regular schedule. 1:38 p.m. Francis Marion and Sumter National Forests will close all campgrounds beginning at noon today, and they will stay closed until further notice due to Hurricane Florence. There is also a temporary suspension of creating reservations. 1:36 p.m. A Purple Heart Medal presentation scheduled to take place September 15 at 11 a.m. at the NCO Club at Fort Jackson has been postponed due to Hurricane Florence.The ceremony will be rescheduled. 1:33 p.m. USC will issue refunds for the Marshall game. Details to be announced one the University reopens. 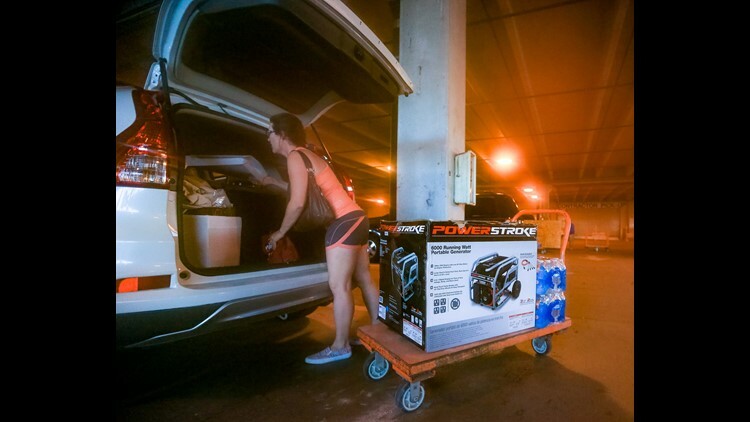 1:26 p.m. Are you going to be using a generator for the first time? Here are a few tips. To prevent emissions from drifting indoors, always place a portable generator as far away from doors and windows as possible. If you feel sick, dizzy or weak while using your portable generator, get to fresh air immediately and call 922. 1:17 p.m. 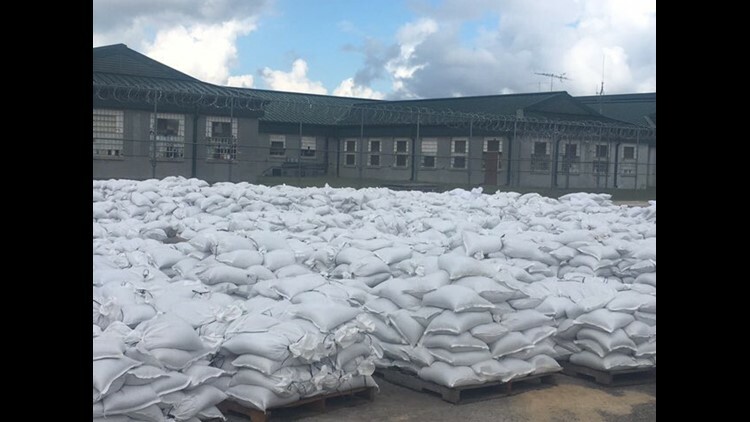 Inmates at MacDougal and Wateree have filled over 35,000 sand bags. 110 mph winds at 5 a.m.
Interstate 26 lane reversals end at 6 p.m.
1:12 p.m. Richland County offices will close September 14 and 17, with normal hours and activities resuming September 18. 1:09 p.m. Rumors about a curfew being put in place in Orangeburg County are FALSE. 1:07 p.m. Resident Halls at USC are on lockdown starting at 5 p.m. Thursday. 12:59 p.m. Gov. McMaster will hold a press briefing with state officials on Hurricane Florence's potential impact in South Carolina at 2:30 p.m.
12:56 p.m. 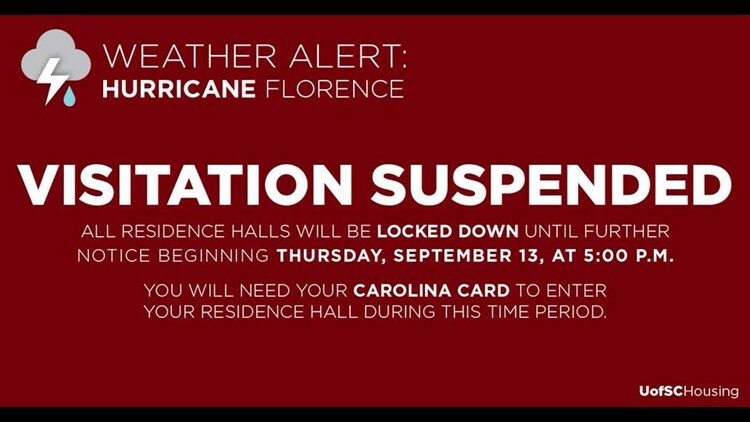 The University of South Carolina is closed due to the impact of Hurricane Florence. They will issue ticket refunds for the Marshall game. Details on that timeline and process will follow once the University reopens. 12:46 p.m. Gov. 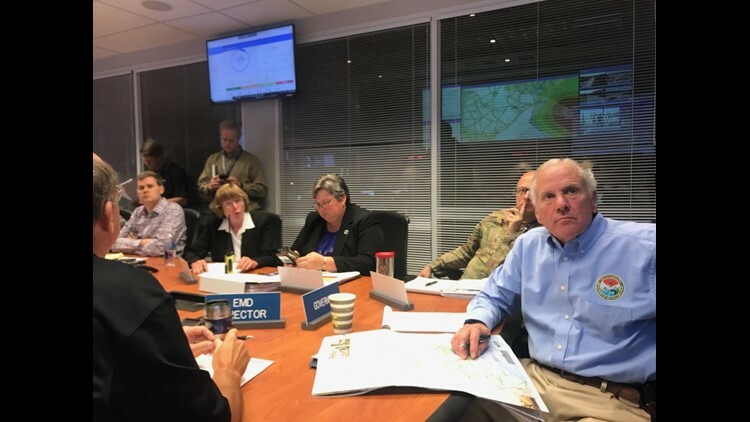 Henry McMaster sits down with SCEMD at their operations center in Columbia to further discuss plans for Hurricane Florence. This comes ahead of an expected press conference with the governor later today. 12:34 p.m. News19's Jacob Reynolds checked in at Myrtle Beach this morning — a scene he described as SPOOKY! 12:32 p.m. Welcome to Columbia! USC is housing students from the College of Charleston at the Columbia campus. 12:28 p.m. Lane reversals have begun on Highway 501, and will start at 6 p.m. for I-26. The evacuation remains in effect. 10:28 a.m. SCE&G is planning to hold a press conference today at 11:30 a.m. to discuss how it is responding to 'potentially significant and prolonged outages' and how customers should be preparing. 9:06 a.m. Check out this touching photo shared by DHEC yesterday. The photo shows an elderly couple being evacuated by an EMS crew from a coastal nursing home. 7:13 a.m. News 19's Jacob Reynolds was happy to find a Waffle House open early this morning in Florence, SC. You guys, God bless Waffle House. 9:54 p.m. The COMET bus service will be suspending all transit services after the 5:30 p.m. departure from routine terminals on Thursday September 13 until further notice. 9:33 p.m. At least 100 line trucks are staging outside Columbiana Mall in preparation for Hurricane Florence. 9:29 p.m. News19's Jacob Reynolds signs off from Myrtle Beach Wednesday with a windy video of the coast. I sign off tonight with another video of the Myrtle Beach coast at around 5:30pm on Wednesday, September 12th. As you’ll notice compared to yesterday’s— wind is the new sound. 8:21 p.m. 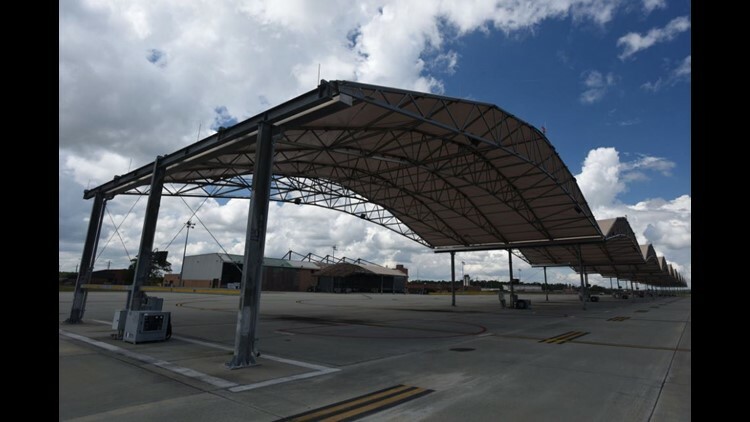 The runways at Charleston Airport will close at 11:15 p.m. tonight and will remain closed at least until Friday. 8:16 p.m. City of Columbia information number for Hurricane Florence: 803-545-3300. 8:04 p.m. A South Carolina sunset shows the calm before the storm. 8:01 p.m. DHEC has assessed 181 dams across South Carolina. 7:37 p.m. 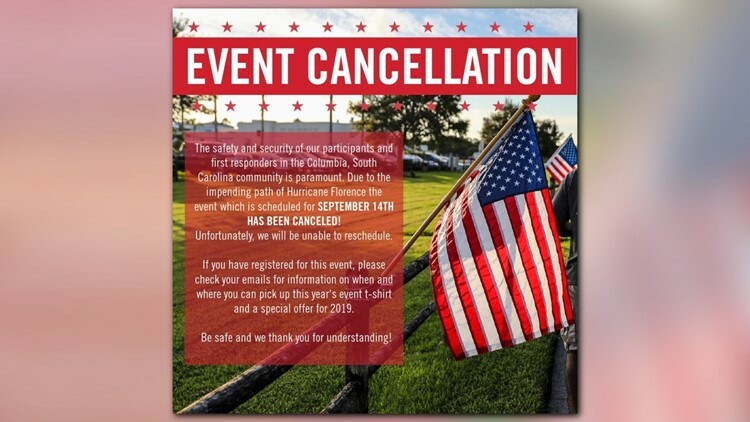 The University of South Carolina equestrian team's exhibition against the South Carolina IHSA Club Team has been canceled due to Hurricane Florence. They will now host their season opener against SMU at 10 a.m. Saturday September 22 at One Wood Farm in Blythewood. 7:11 p.m. The process of setting up sandbags has begun in Myrtle Beach. 5:30 p.m. City of Columbia officials are urging citizens who want to call for information about the hurricane to call 803-545-3300. The customer care center will be staffed 24/7. This is for people who are experiencing non-emergency issues. If you are having an emergency, you should still call 911. 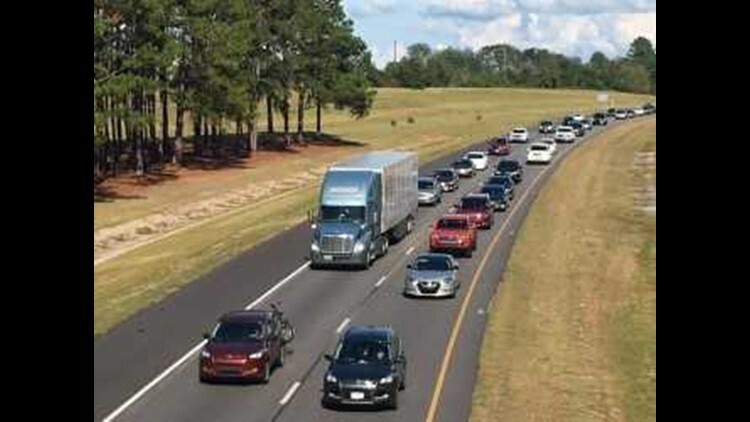 5:19 p.m. South Carolina Department of Public Safety will being to break down the lane reversal on I-26 tomorrow at 6 p.m. The reversed eastbound travel lanes of I-26 will close at 6 p.m. in Charleston at I-526. The process is expected to take about four hours. 5:11 p.m. If you have evacuated from the coast and are looking for something to do, the South Carolina State Museum is offering free admission to all kids out of school under 12 and all families evacuating from the coast. Hours are 10 a.m. to 5 p.m and the museum is located at 301 Gervais street. 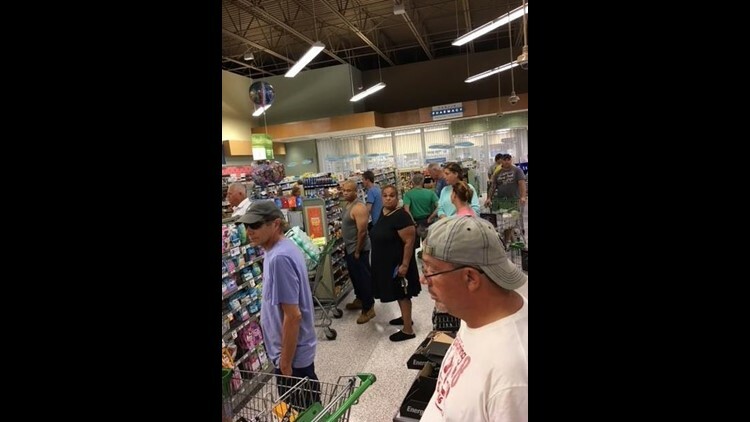 4:15 p.m. Our Nic Jones is in Sumter County where he caught up with folks stocking up on sand ahead of hurricane Florence. 3:56 p.m. HAVE QUESTIONS? Call the News 19 Help Desk at (803) 647-0299 from 5 - 8 p.m. tonight. 2:27 p.m. Check out this photo tweeted out by the Horry County Emergency Management Division. This photo about sums up our current situation. 1:50 p.m. News 19's Jacob Reynolds is live in Myrtle Beach, folks have a message for Florence. Here's what he's seeing. 1:14 p.m. 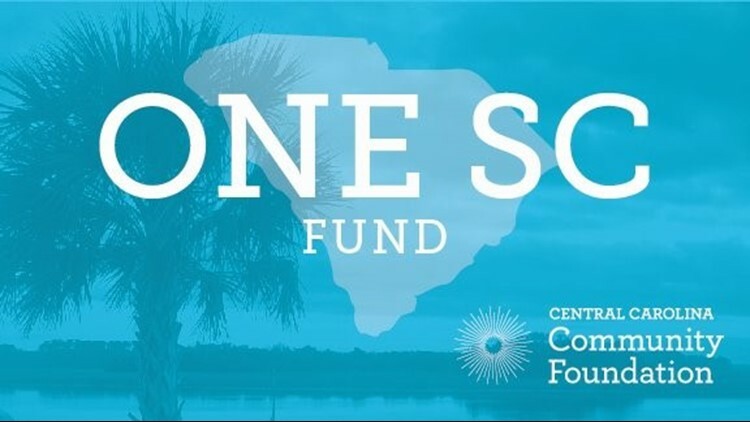 The One SC Fund has been activated to accept financial donations for Hurricane Florence recovery efforts statewide. The fund, managed by the Central Carolina Community Foundation, was founded by then-Governor Nikki Haley in response to the 1000-year flood of 2015 to provide a secure, guaranteed way to donate funds to relief organizations that provide direct services on the ground for disaster recovery in South Carolina. 1:08 p.m. One Myrtle Beach woman tells news 19's Jacob Reynolds she's nervous, but she's staying put. 12:28 p.m. The Tunnel to Towers run scheduled for September 14 has been canceled and will not be rescheduled. 9:38 a.m. European astronaut Alexander Gerst tweeted out incredible photos of Florence from the International Space Station.